Mindfulness is the act of taking time to be in the moment while paying attention to your thoughts, feelings, and experiences. Mindfulness can help lower your stress and has also been associated with improved blood pressure, improved sleep, and reduced anxiety. You don’t need fancy equipment to practice mindfulness, it can be done anywhere, any time of the day, and in any way that works for you. Take a few minutes at the beginning and end of your day to sit alone and think. Go for a walk outside by yourself, counting your steps while you breathe in and out. 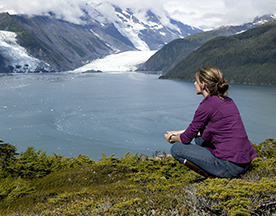 During the workday, take a few moments each hour to breathe and relax. Before returning to your work, allow yourself to regroup and let your mind settle. Feeling stressed? Most Americans do. 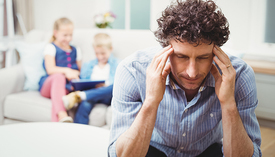 Some stress is normal and even needed; too much stress can affect your quality of life, health and performance at work. Prolonged stress is linked to chronic health conditions such as heart disease, hypertension, and depression. Aim for at least 2-1/2 hours of moderate physical activity a week. Any amount can help! To make the parfait, spoon 1 tablespoon of yogurt into the bottom of each 8-ounce wine or parfait glass. 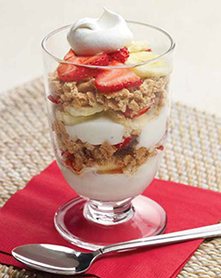 Top the yogurt with 1 tablespoon sliced bananas, 1 tablespoon sliced strawberries, and 1/4 cup graham crackers. Repeat the yogurt, banana, strawberry, and graham cracker layers. Top with a rounded tablespoon of fat-free whipped topping, if desired. Serve the parfait immediately, or cover each glass with plastic wrap and chill for up to 2 hours before serving.